Bluxome Street Winery. Photo by Todd Tankersley. So in 1999, Lewis and Neely cofounded Hip Chicks Do Wine in a former glass artist’s studio in Portland, Oregon—45 minutes from the nearest vineyard. 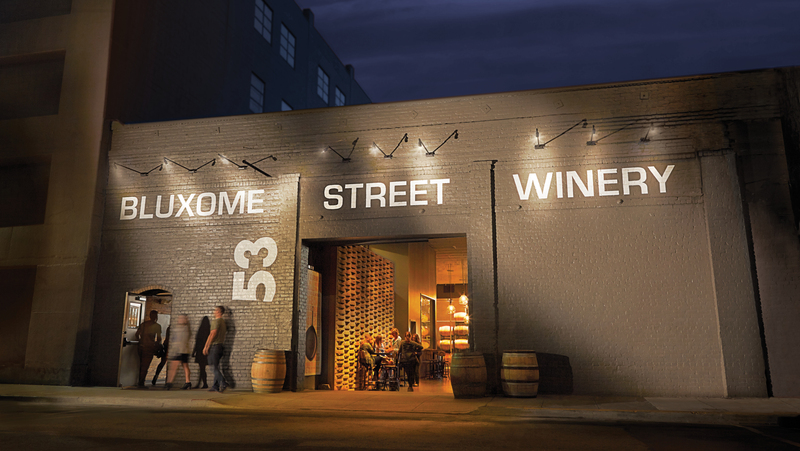 At the time, Hip Chicks was one of a small number of city-based wineries in the United States, but now urban wineries are booming. In Portland, the PDX Urban Wineries Association has 16 member wineries; the Seattle Urban Wineries collective counts nearly 30 members; a collection of more than 20 wineries operate tasting rooms or make wine in California’s Lompoc Wine Ghetto; Oakland and Santa Barbara promote urban wine trails; and one enterprising start-up is even growing grapes on a rooftop in Brooklyn, New York. Finally, there’s the matter of convincing drinkers that wine doesn’t have to be made in the country—or, in the case of Rooftop Reds in Brooklyn, New York, that grapes can thrive on a rooftop. Founder Devin Shomaker says Rooftop Reds will complete its first harvest this fall, and the wine will be made at Point of the Bluff Vineyards, near the Finger Lakes, upstate. Bucking the traditional approach to winemaking suits him just fine. Jon Page is a writer, editor, and photographer based in the San Francisco Bay Area. Follow him on Twitter and Instagram.